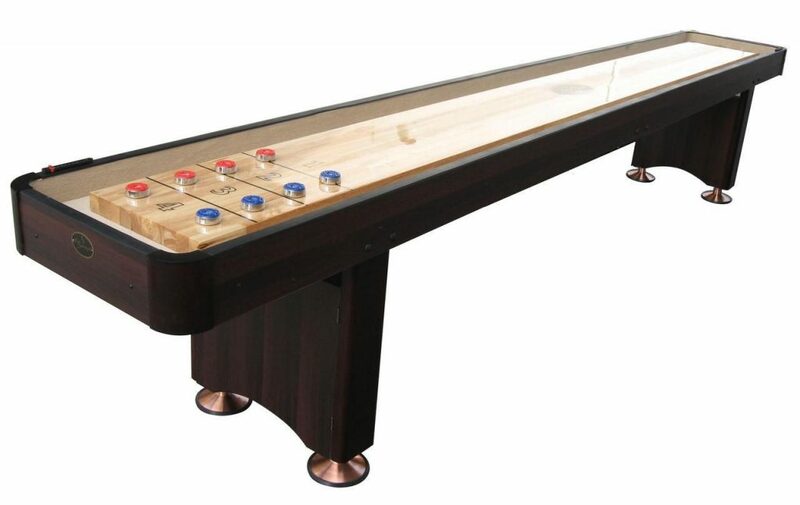 When shopping for a shuffleboard table for your home game room or bar, price is always a consideration. You don’t have to pay top dollar for a good quality table. Look for features that are important to you—length, style, materials—when choosing between different models. Find the table with the most bang for your buck with our guide. Where to find the best shuffleboard tables? 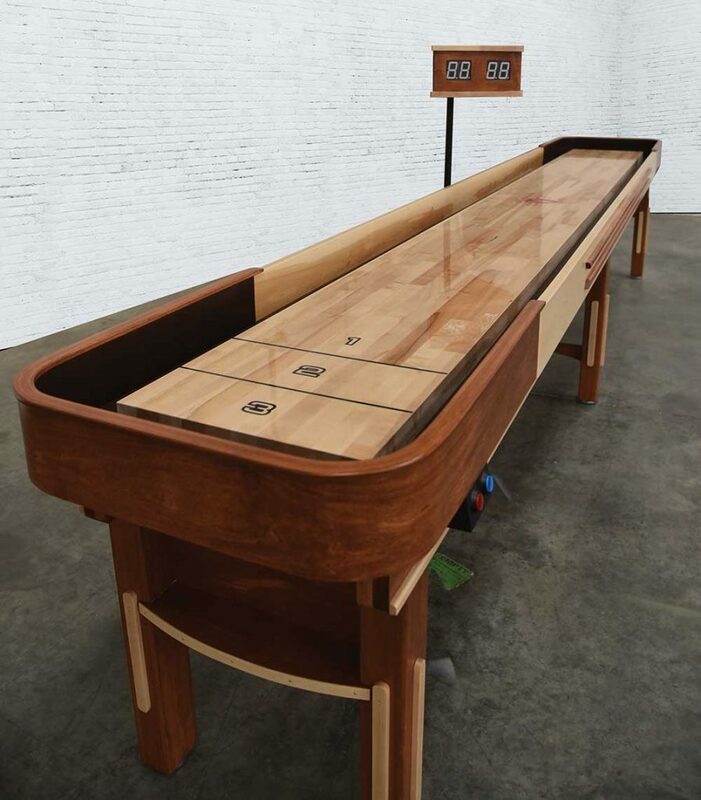 Shuffleboard.net offers an incredible selection of beautiful shuffleboard tables with prices for every budget. Our price match guarantee means if you find a table advertised lower elsewhere, we will match that price to earn your business! Here’s a list of a list of quality tables that are stylish, durable, and affordably priced. The Woodbridge is the best table when you’re trying to budget around $1,000 for a shuffleboard table. The Woodbridge by Playcraft is an ideal home shuffleboard. The Woodbridge is available in a variety of finishes, to match seamlessly with the rest of your furniture and home décor, and in lengths from 9’ -16’. The hardwood playfield is finished with 10 smooth coats of polyurethane for accurate gameplay. One-piece legs give superior stability. The Woodbridge will transform your home game room. To get the most out of your dollar, The Austin is a budget friendly shuffleboard table, featuring a straight-line design in a beautiful mahogany finish. The 1.5” thick playfield is covered in glossy polyurethane for speed and accuracy. The pedestal style legs feature hidden storage for weights and accessories. Enjoy sturdy and accurate gameplay with The Austin. To bring the fun of shuffleboard outdoors to your backyard or patio, you will want to look for a weatherproofed shuffleboard, like The Extera by Playcraft. This sturdy 9’ table is crafted from aluminum and features bright accents. The Extera includes durable abacus scorers and a table cover. Covering your outdoor table, when not in use, protects against sun damage and ensures better game play for longer. Easy to assemble, The Extera is perfect for summer gatherings with family and friends. The Venture Grand Deluxe Sport is an excellent and well-crafted model. This one is a whole of table for the price! If you’re searching for a table under $2,500, the Grand Deluxe sport is your best option. 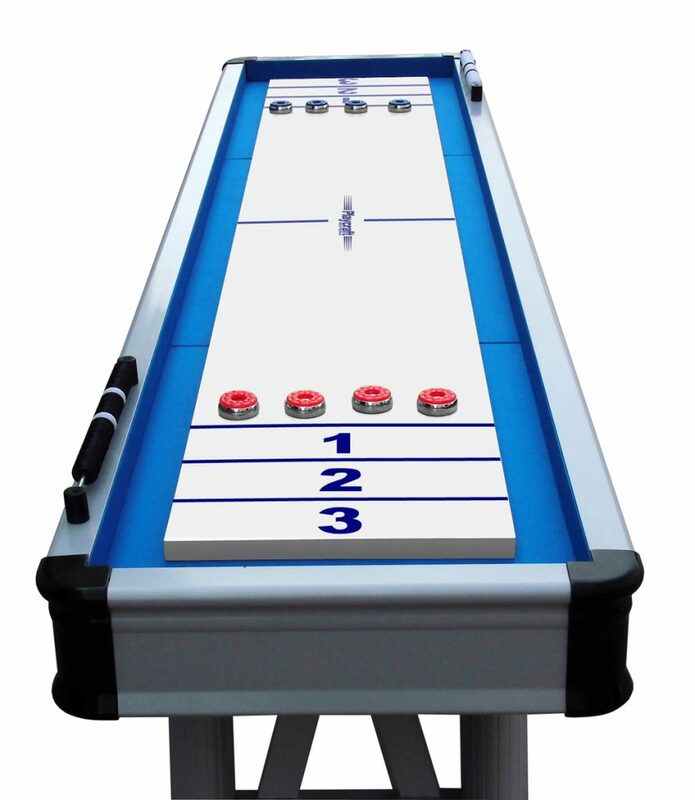 Enjoy the luxury of your own customized shuffleboard at an amazing price, with The Grand Deluxe Sport by Venture. This handcrafted table features solid wood construction and a Venture exclusive playfield. Custom options on this mid-century modern inspired design include finish, stain, lights, and scoring. Your custom logo or design can also be added to the playfield. Transform your game room into an extra dining space with a dining top. The Grand Sport Deluxe offers the best value in style, quality, and customization. The Hudson Grand Hudson shuffleboard table is a true work of art. You will not be disappointed with this table. 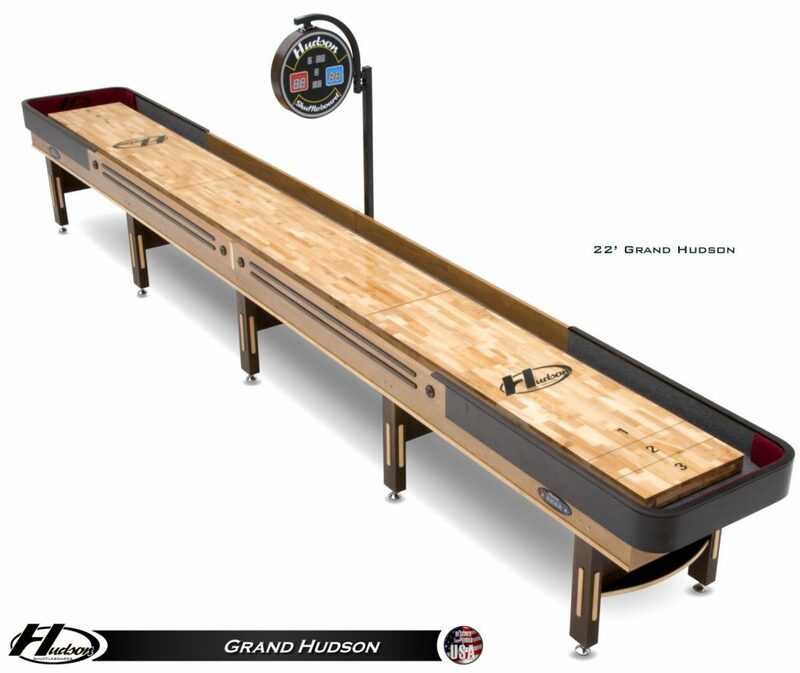 The Grand Hudson is one of the best recommended tables under $6,000 offering durability, expert craftsmanship, and quality game surfaces. Available in a variety of sizes, 9’-22’, The Grand Hudson is fantastic for sports bars and tournament play. This table can be customized with its finish, adding a logo, weatherproofing, coin operated scoring, and more. The cradle is made of solid maple and walnut for long-lasting sturdiness, and features a professional-grade playfield. The Grand Hudson’s classic American style makes a great addition to any entertainment space. 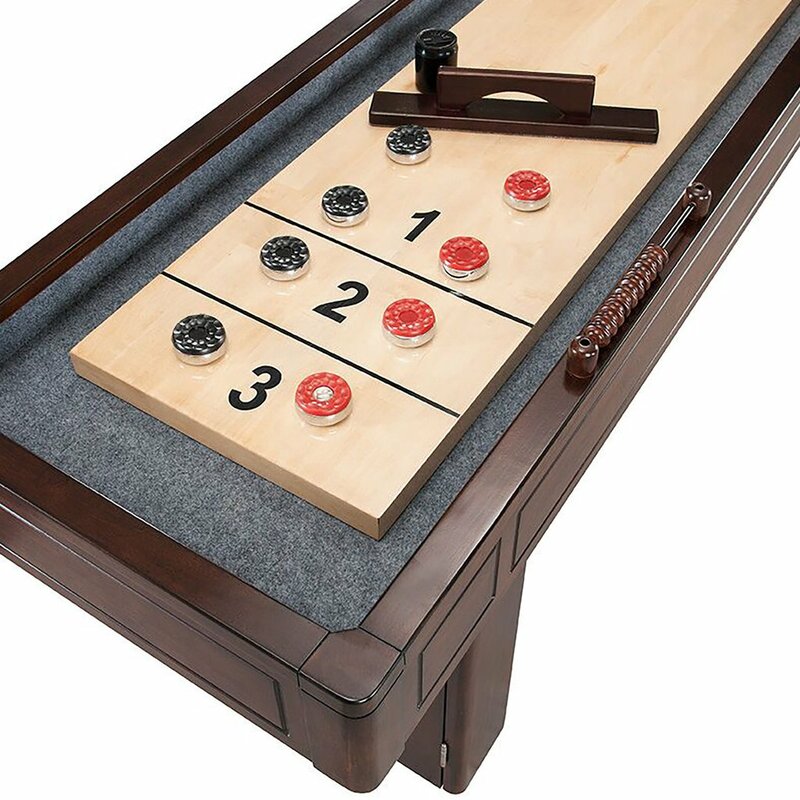 Finding the ideal shuffleboard for your game room or bar is easy at Shuffleboard.net. Explore a variety of styles, sizes, and customization options in our full catalog. We are proud to offer our customers Price Match Guarantee on all shuffleboards. Talk to a Shuffleboard Expert by contacting us seven days a week to help you find the perfect table for you that your wallet will love.